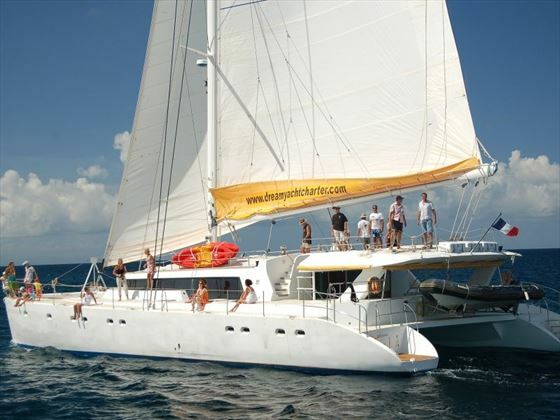 Jump on board the wonderful Mojito 82 catamaran, offering 12 air conditioned cabins and large sunbathing decks, and explore some of the Seychelles most naturally beautiful inner islands. Starting in Mahe on a Monday at 1pm, you’ll sail across to Saint Anne Park, Coco Island, La Digue and Cousin Island before disembarking in Praslin, enjoying snorkelling and cycling excursions along the way. 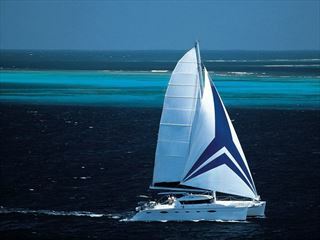 The Mojito 82 is a relaxing and comfortable way to enjoy the Seychelles’ incredible azure waters. 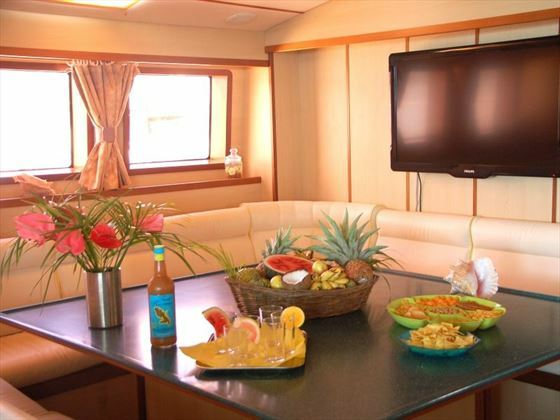 The top deck is perfect for enjoying the sunshine and watching the islands go by, and the Mojito 82 even offers modern amenities and a cook that will cater for your every need. Before you embark on your journey on Monday, you’ll be able to enjoy the beachside paradise of AVANI Seychelles Barbarons Resort & Spa for two nights, taking advantage of its wide stretches of pristine beach and peaceful spa. 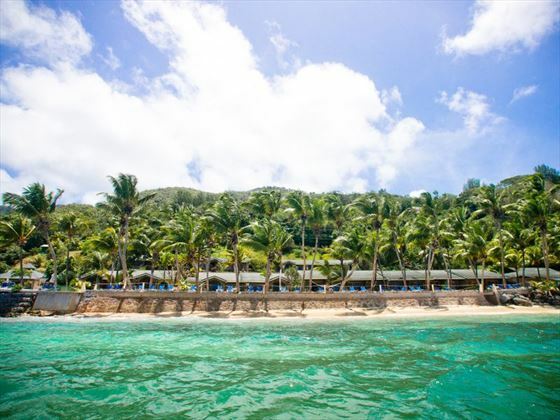 That’s not all, after your cruise on the Mojito 82, you’ll stay at the romantic Coco de Mer Hotel in Praslin for another two nights, enjoying live music at the fun beach bars and soaking up the sun. 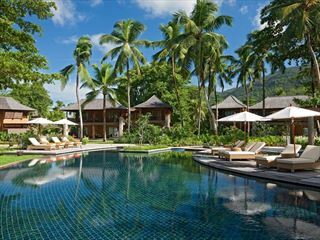 On arrival in Mahe, you will travel to your home for two nights: the colourful AVANI Seychelles Barbarons Resort & Spa. 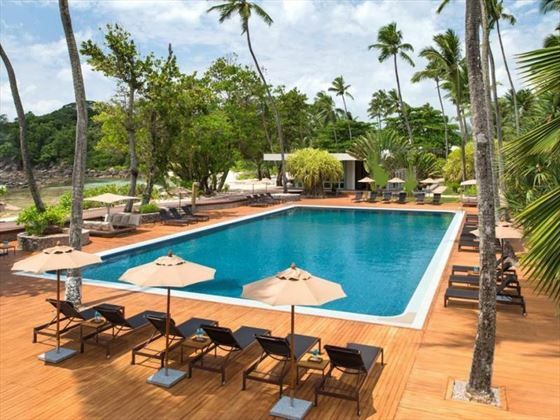 Nestled on the golden sands of Mahe’s western coast, this is a lovely hotel with a quiet, relaxing ambience. 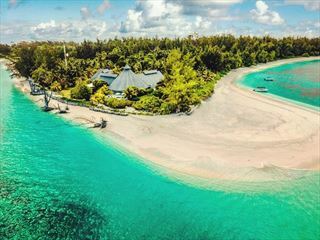 Ideal for rejuvenating and soaking up the sunshine, you can spend the next couple of days tucking into delicious Asian cuisine at Tamarind restaurant, lounging on the beach, or hiking around the beautiful Mahe landscapes. 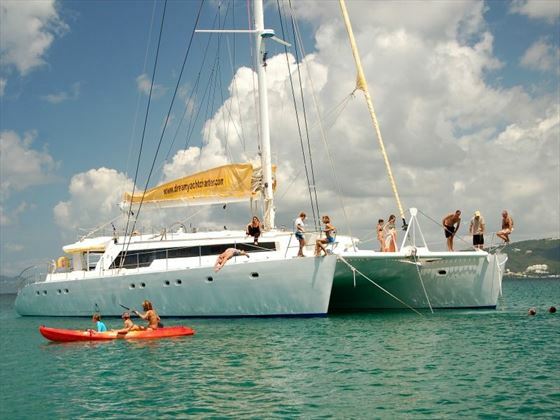 On Monday you will board the Mojito 82, a lovely 12 cabin catamaran at 1pm, sailing along the azure waters before anchoring for the night at Saint Anne Marine Park. On day five you’ll explore Saint Anne Marine Park, one of the best locations for snorkelling amongst vibrant coral reefs and schools of tropical fish in the crystal clear waters. After lunch in the sunshine you’ll cruise to Coco Island, formed of towering rocks that are patterned with regular stripes carved by the sea. This beautiful island offers the perfect beach paradise for more sunbathing. 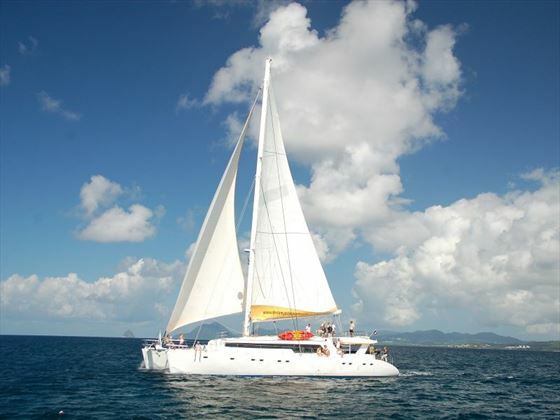 Afterwards, you’ll experience unforgettable snorkelling and anchorage in front of the gorgeous harbour of La Digue. Start the day by renting a bike at La Digue and discovering the stunning island’s white sands and myriad of marine animals, including fish, sharks and stingrays. 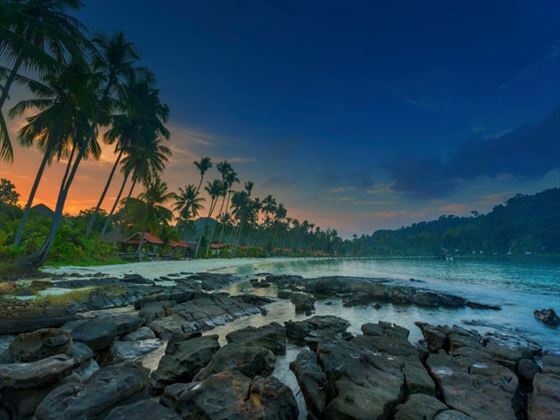 Cycle amongst the luscious palm trees and you may even spot the rare Seychelles paradise flycatcher, as well as travelling past quaint houses with palm leaf roofs and copra factories. The island is very peaceful, with no cars in sight, only bicycles and carts drawn by oxen. 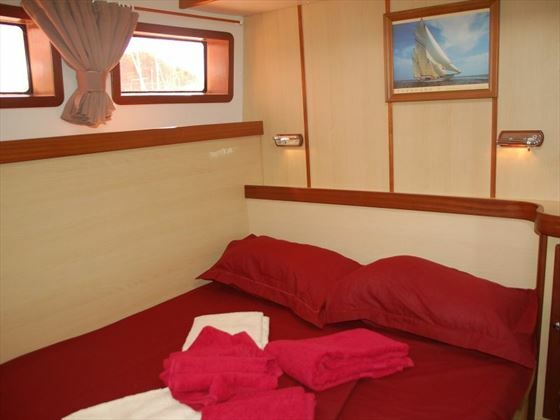 In the evening you’ll anchor in the La Digue harbour. Today you will visit Cousin Island, a spectacular nature reserve since 1968. Covered in indigenous woodland, freshwater swamps, and rocky coast lines, this island is a sanctuary for rare species of birds, as well as marvellous giant tortoises. 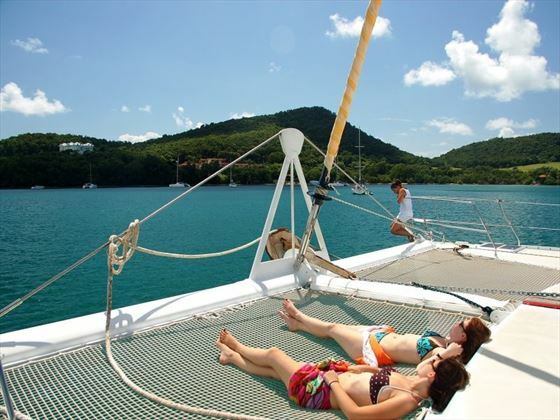 You’ll tuck into a delightful lunch on board the Mojito 82, as you sail towards Praslin and disembark at Baie St. Anne at 2.30pm. Afterwards, you’ll travel to Coco de Mer Hotel, where you’ll spend the next two nights. The Coco de Mer Hotel, your home till the end of the trip, is a beautiful, romantic hideaway, nestled on Praslin’s southern coast. Named after the unique Coco de Mer palm trees that surround the hotel, this is the perfect spot to sunbathe on the beach and watch striking sunsets, with sea-facing rooms, live music, a revitalising spa, and the popular Mango Terrace Bar and Grill. 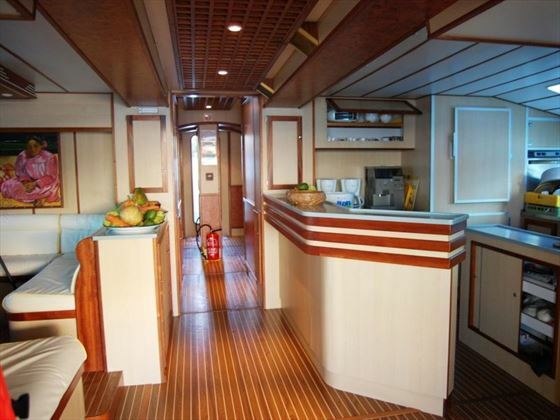 The Mojito 82 offers comfortable accommodation in 12 double cabins with private bathrooms, sleeping a maximum of 24 guests and all with a magnificent sea view. 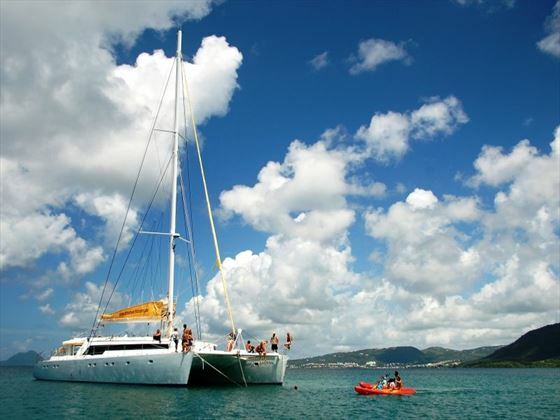 The crew for the catamaran consists of a captain, a steward/cook, and a decks hand.